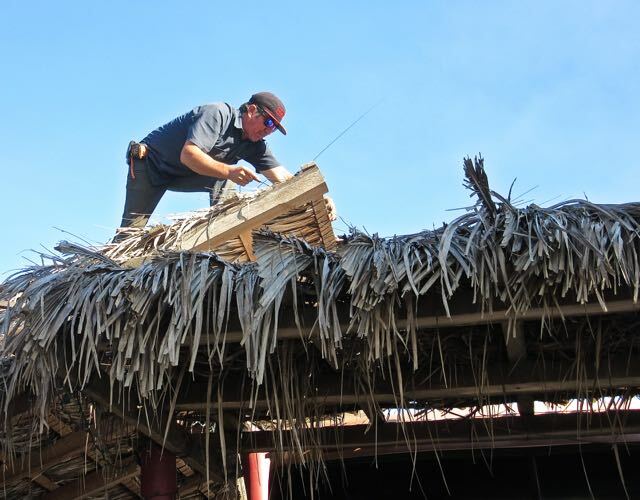 There has been a lot of wind this year and our palapa needed some repairs. If you don’t keep maintaining it, it will get worse much quicker. 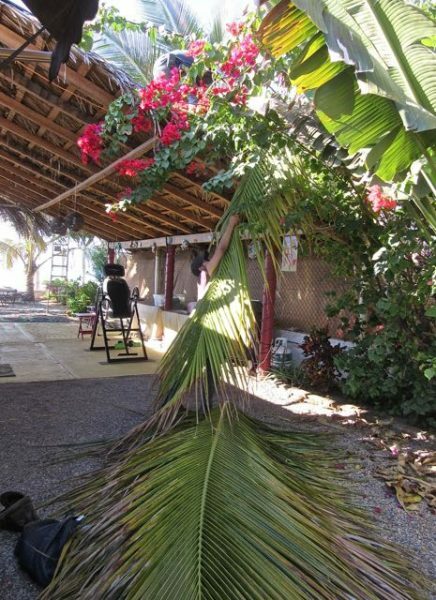 Our palapa was born in November 2011, click here for that post. If you click the next few posts from there you will see how it came about and read some interesting stories along the way. Plus there are some sweet photos of the girls from seven years ago. 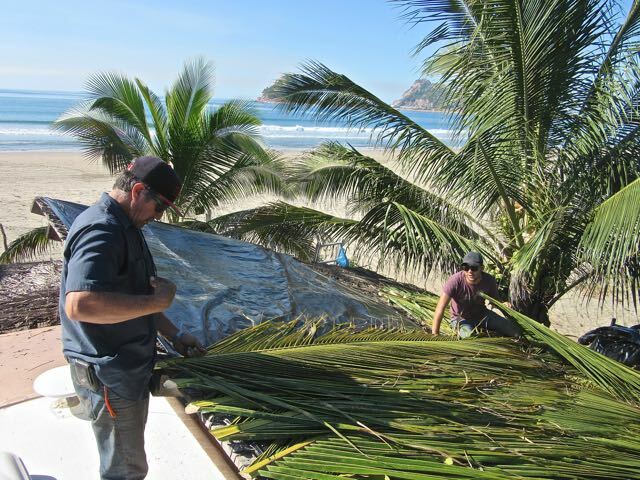 It was difficult to read the posts and see the photos while searching for day one of our palapa. 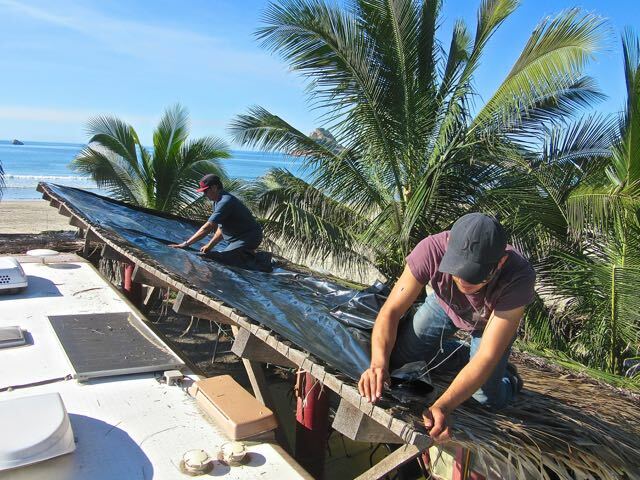 Our last major palapa repair was January 2016, click here for that link. We had to move the RV out of the site for that one and at the same time we were doing major RV repairs. The repair yesterday wasn’t so drastic. 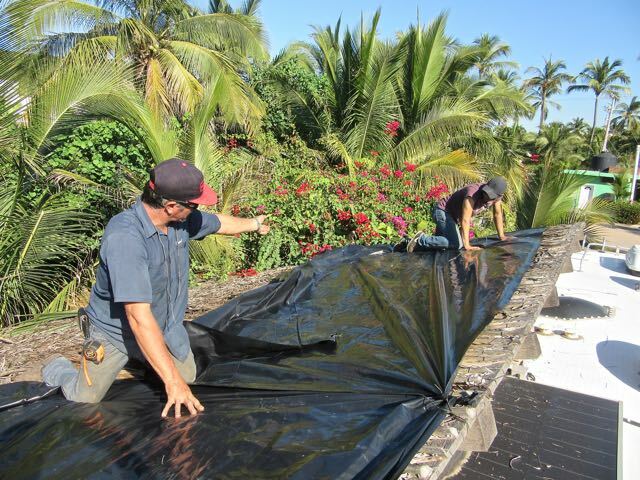 The top layers of palm fronds or palmas as they are called here were removed as was the layer of plastic. The bottom layer of palmas remained so the mess was not so great as three years ago. 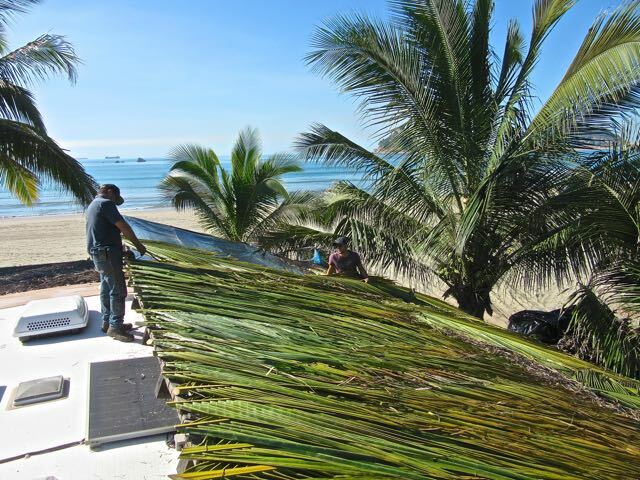 It took a long time for Lupe and his helper to gather all the palm fronds as they need to climb the tall palm trees in the plantations and are only able to cut one or two off of each tree. Very labor intensive but they did bring enough for the job. The old plastic was brittle and cracking and needed to be replaced. 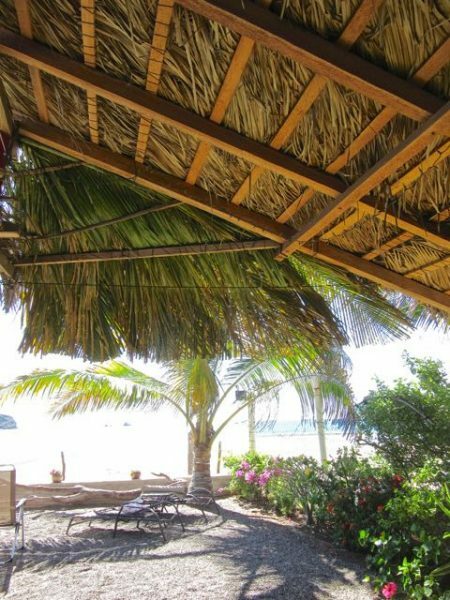 Everything is tied to the main frame of the palapa. You can see one of our four solar panels. Once the plastic was in place the branches were handed up one at a time. 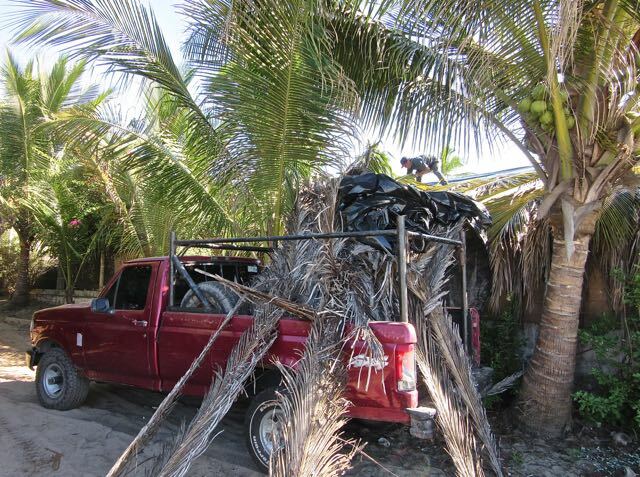 Lupe parked his truck in the lane and was able to throw the disintegrating palm fronds over the fence. Much easier cleanup at the end of it all. This weird looking doll was on the top of our palapa roof. How did it ever get up that high? It is a slow and methodical process. Each branch must be tied into place. 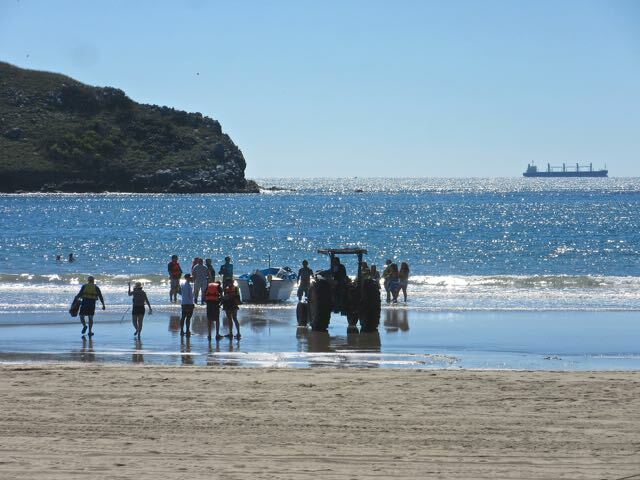 Meanwhile the tide was so far our that a tractor was needed to push the banana boat out. One of the key parts of the palapa is getting an angled long fringe to keep the late afternoon sun from heating up the RV. We spent the rest of the day cleaning up and reorganizing our yard. Followed by guitar playing and a book and wine for me. Happy to have the job completed. 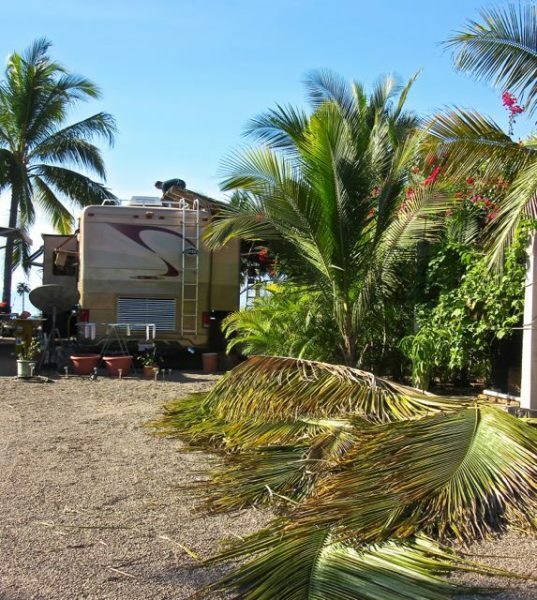 November 2011 was the start of our third season here at Tres Amigos RV Park and our first here on this site. All we had was our dust screen fencing and our dog fence. Note the lack of any plants or gardens. The plants you see on the left are in pots that we had started collecting back in our first month here in 2009. What a change we have made to this empty site. We even have to bring in our own pea gravel. I remember when we met you there in 2009 and then followed you once to started your blog, lots of fond memories of those years. Yes lots of wonderful memories. I know that one day we will catch up again. Interesting to watch a papa being built. Hope that wasn’t a voodoo doll…? We really love our place here and have worked hard to make it our own. I tried to put a little happy face with a winking eye but a question mark showed up….wonder why. I have no idea, I am the least techie person ever. Let me know if you don’t get my next blog post. Almost done. One more big project, but we might wait until after Christmas. 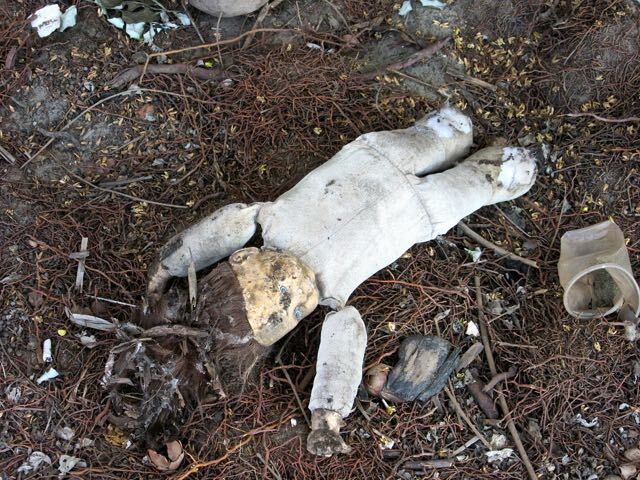 Looks like a bunch of kids may have found the doll on the beach and have been playing around your palapa during the months you were not there. Probably playing swing the doll by an arm or a leg and it ended up on the palapa roof. Kids around here shoot these toy bows and arrows, and we find the arrows on the house roof all the time. The new roof will keep you nice and dry and last for years to come. I hope you kept the doll!